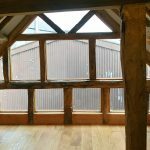 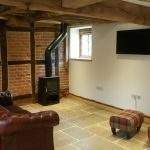 A Barn conversion in little hamlet of Yarkhill near Hereford, the original barn was stripped back, all the brickwork and beams sandblasted bringing the building back to a shell, ready for the conversion works. 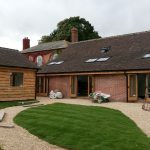 The barn is split into 2 separate holiday lets, with the option of opening a set of doors between the 2 dining areas allowing the whole building to be let to a large party without segregation. 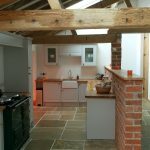 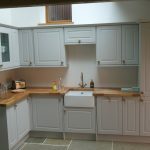 both were equally well equipped with large french doors opening out into the garden, high spec kitchens with AGA range cookers, woodburners in the snug areas and rustic timber features throughout, including the solid timber staircases constructed in keeping with the original timbers on show. 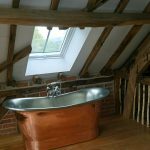 In addition to the high level of finish generally, where one of the properties is outfitted to allow wheelchair access to the downstairs bedroom and facilities for disabled guests, the other has an entire gable glazed built to match the original beams and copper bath for added luxury. 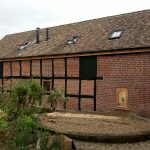 Outside located in its own grounds next to the owners house and with access to the connected orchard, There is another building fitted out with a bar to further encourage the use of the whole space.